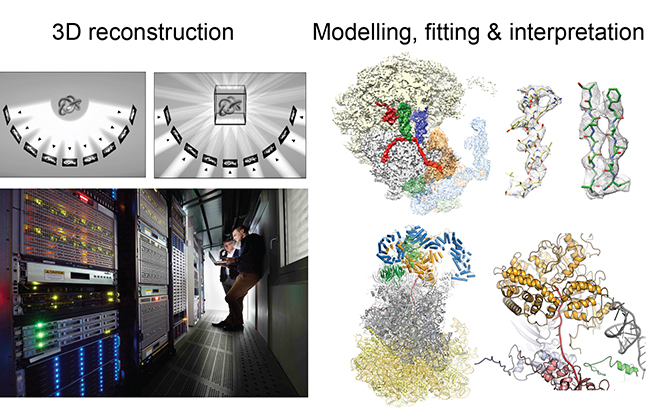 The main technique to determine 3D structures in our lab is cryo-electron microscopy (cryo-EM) in combination with Single Particle Analysis (SPA). Cryo-EM is a special transmission electron microscopic (TEM) technique few where few micrograms of purified biological complexes are vitrified by shock freezing. Under these conditions the samples are preserved in their native states and the acquisition of phase contrast images using TEM is possible. During SPA, images of individual particles (projections) are used to obtain a three dimensional structure. This process is highly computationally expensive and is performed on high performance computing (HPC) Linux clusters. The final result is an electron density which is interpreted using available crystal structures, homology models or in case of high resolution (< 3.5 Å) by de novo building of structures. Preparation, vitrification and cryo-EM data collection. 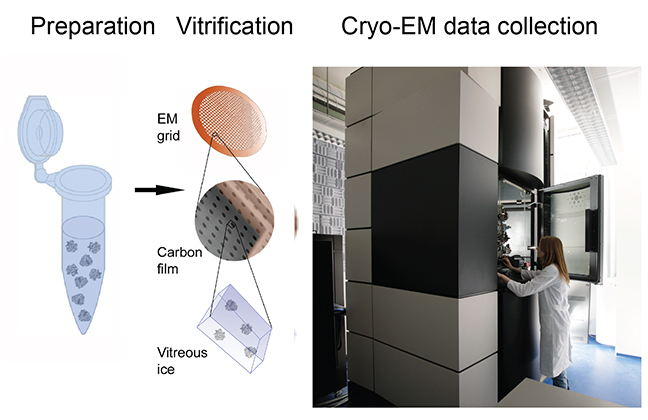 Cryo-EM underwent significant technical advances in the last years enabling the structural biologist to obtain high-resolution electron density maps with near atomic resolution, thus, allowing for a detailed molecular analysis of macromolecular complexes. The main reason for this “resolution revolution” is the development of direct electron detectors (DED) for image capture. The DEDs provide a higher signal-to-noise ratio and data acquisition is so fast, that instead of a single image entire movies are collected that allow for motion-corrected very clear images. In parallel, also image processing software was improved by the implementation of modern algorithms and enabling the use of GPUs, altogether resulting routinely in structures in the range of 3 Å resolution. 3D reconstruction, modelling, fitting & interpretation.